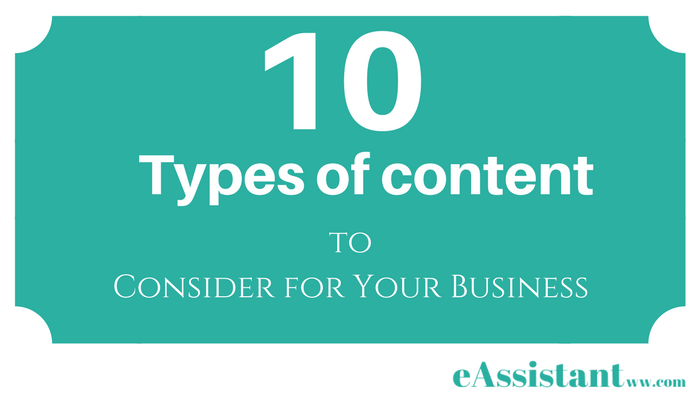 Share the post "10 Types of Content to Consider for Your Business"
1. Graphics With Quotes – These are images that invoke certain emotions combined with quotes from someone famous, or even from yourself. 2. Infographics – If you have data-centric content and need a new way to impart the information to your audience, use an infographic. An infographic is a long graphic with many images and data explained in an easily understandable way. 3. Short Blog Posts – Have blog posts that are about 500 words long that explain information that is very focused on one topic. This type of post can provide an informational overview on a topic, but doesn’t go in-depth. 4. Long Blog Posts – Every person who is using content for marketing should include long in-depth, authoritative pieces of content. These can be anywhere from 750 to 3000 words. These might consist of guides, reviews, and how-to posts. 5. eBooks – An eBook is usually someplace around 10,000 words long. No worry if you split the writing of your ebook into shorter chapters, you can write your book with just 20 short blog posts. 6. eReports – Usually 2500 words at least and up to 7500 words, an eReport usually covers some basic educational information about a topic as well as solutions for problems that the audience may have. 7. Social Media Blurbs – When you promote your blog posts, eBooks, eReports and other content, you will need a social media blurb. You just take a short piece of your writing (blurb) out of your material and put them into a nice graphic. 8. Videos – Creating regular videos for your website or blog and putting them on YouTube is a great way to get more views and create more content. Videos are shared more often than text content and have the potential to go viral. Also, you can re-use your video content for a lot of other content ideas – but that is another post :). 9. Testimonials – Asking your customers and clients to provide testimonials is a great way to get content on your website that you did not create.Testimonials are a wonderful way to show how happy your clients are with you. 10. Podcasts – These are audio files and are great for those of your listeners who like to take the content on the go. You can create different types of content by repurposing content that you already have. For example a how-to blog post can become a how-to video. Several blog posts on one topic can become an ebook. Content from a blog post can be used as graphics with quotes, a podcast and a video. The possibilities are endless!